Roads and streets are often an afterthough once the trains are running. Like structures and scenery, it's far better to plan ahead for modeling roads. If you're like me, you probably didn't think it through. However, your layout is going to look more plausible if you add some roads and streets. Draw the path of the road on the plywood, homasote or foam board. Use cork roadbed for the base of the road and affix it with carpenter's glue or foamboard adhesive. Cover the cork with Evergreen 0.15" styrene sheet cut into 24 scale foot width. A country road or suburban street could be narrowed to 21 scale feet if you're tight for space. Nine scale feet per passing lane is about the minimum recommended width. Scribe expansion joints in the street every 12 scale feet if you're representing concrete. Scrape the back of an X-Acto knife across the surface in place to add cracks to the pavement. The road can be blended into the adjacent scenery with Scultamold which is a papier maché kind of putty. It is easy to file or sand when dry. Concrete gray is a good color. Roads aren't really black unless they're in a rainstorm. Powdered brown and black chalks can be applied with a brush and a Kleenex or your fingers to add streaks to the pavement to represent dirt and oil streaks. The street crossing the tracks was made with styrene covered with a commercial plastic asphalt sheet secured with Goo. The sidewalks in the background are also commercial products. Street in North Point on my UNRR RR. Another technique I've used is to build up the road with drywall compound. You need to keep the layers thin or you'll get cracks. This creates a more uneven surface than using styrene, typical of roads that need repair. The surface can be painted gray. Looking down the lead past the section houses at Northpoint. The drywall compound road crosses the tracks to the backdrop. The fire engine is an attempt to disguise the joint. I've used a combination of low relief buildings and a cut-out commercial backdrop. The building at the left also has some piping on it to extend its footprint into the foreground. More details can be added to this scene. It depends how far you want to go. Dirt roads are the easiest to make. Dirt road crossing tracks to section sheds. Apply a thin layer of Sculpamold over the cork with a putty knife. When dry, paint the surface with the beige or brown earth you use as a ground cover base. Sprinkle on some brown or gray ballast and contain the edges with strips of wood or styrene. Use a wall paper roller or roll of masking tape to smooth the surface. Run the wheels of a car, truck or cart through the gravel to make some ruts. Mist with alcohol or water with a few drops of dishwashing detergent and then mist with a 50/50 mixture of white glue or matte medium and water. Be sure to cover surrounding scenery with newspaper and the track with masking tape before spraying. In my experience, an eyedropper tends to cause puddles in the road so I found misting works better. Where a road crosses the track, build up the road to the outside of the rails. Use a hobby knife to trim the styrene (if that's what you're using) to the curvature of the rails. Ensure that the top of the road is not above the rail heads. Shape the styrene in the same way between the rails but make sure to leave room for the wheels to pass. Check with an NMRA gauge or run a wheelset through to check clearance. If you use drywall compound, use an old wheelset to make the grooves. Slope the edges of the road between the rails to lessen the chance for couplers to snag. The parking lot at Rollin Sawyer's. Dirt rules. Another method is to use strips of wood for a rural level crossing. There are some excellent commercial wood road crossings complete with nail heads by Blair Line and Osborne Models. You can also buy the newer type of rubber mats if you're modeling contemporary road crossings. An old trick was to use roads to disguise the placement of Kadee between-the-rails uncoupling magnets. Sometimes this will work for you if the placement of the road makes sense. Don't forget the area around buildings where cars and trucks park. This is where you can add other junk and details. 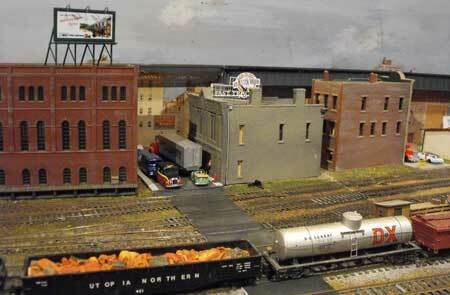 This is the Finescale Miniatures Kit of Rollin Sawyer's chemical plant. I love building wood kits. "One of my favorite tricks when making roads is to add powdered tempera paint into the mix of plaster, spackle, or whatever you use. If “paving” asphalt, I add black, and if it is a dirt road then brown works well. This allows me to carve cracks, expansion joints or potholes into the road without a gaudy white spot to fix later. In addition, if the pavement gets dinged (dropping a screwdriver will do it!) it will still be the same color. Excellent tip, Thom. Thanks for sharing. There are many commercial products for roads and city streets. I have a roll of highway with yellow lines down the middle made by Leisuretime Products. 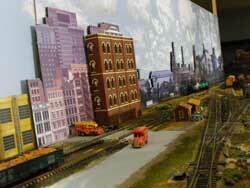 Woodland Scenics makes a Complete Road System kit. Vollmer makes roadways, cobblestones and parking lots. S&S Hobbies sells what they call an E-Z Street kit. NOCH makes Flexible Roadways, marked parking lots and street transfer markings. NOCH also makes Flexible Rubber Roadways. Some of these offerings are more European than American so it depends on what you're modeling. 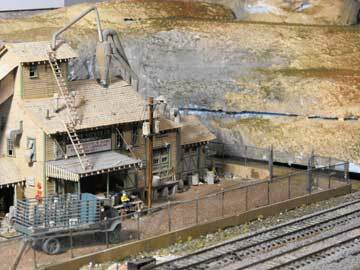 An excellent source for vehicles, diecast autos and other model railroading supplies is Prestige Hobbies. They're on the West Coast. 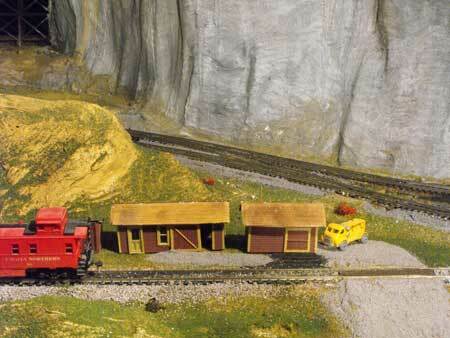 There are more photos of modeling roads and street in the Train Photos Gallery. Return from "modeling-roads" to my Home Page. Do you know about SBI?